This is a guest post by Ruth Seeley of No Spin PR. It’s hard not to laugh at the line in the Wikipedia listing for New Westminster (no, not the part about its seven glory years as the capital of the Colony of British Columbia before Victoria snatched the honour away). The line about it being geographically small but most of it being positioned on the side of a hill. They aren’t kidding about that. I’m lucky enough (or smart enough) to live in the area known as Brow of the Hill, so when push comes to shove I can walk to the Royal City Centre or the library if I have to. Tipperary Park and Queens Park are both accessible on the level. But four or five blocks west of me Queens Avenue takes a terrifying plunge down a hill I’m amazed civil engineers deem road worthy. In fact, when it snows they just close off the bit between 10th and 12th because there’s no guarantee that even with all the will in the world, you’ll be able to stop at the bottom. Heading down 6th, 7th or 8th to Columbia and the SkyTrain stations isn’t terribly do-able, and I imagine heading back up would be even worse. What I’m saying is that to access New West’s five SkyTrain stations, you usually have to take a bus. Which is enough of a disincentive for me to not be willing to take the SkyTrain downtown, much as I long to not worry about parking (or worry about whether I’ll remember where I’ve stashed the car, sigh). It’s not the length of the bus trip; it’s the length of the wait for the bus that does it for me. Consultations are being/will be held in Surrey, White Rock, Vancouver, Burnaby, Langley, North Vancouver, Coquitlam, Maple Ridge, and Richmond. Yes, yes it is. If you’re close to the SkyTrain and don’t mind travelling to North Burnaby. And if you don’t mind the fact that your community’s been left out yet again. Because this isn’t the first time New West has been overlooked by TransLink. When I worked on a project a couple of years ago to encourage greater use of public transit in the Metro Vancouver area, New West didn’t make that list either. A series of surveys were mailed out by Social Data Canada (a German-headquartered firm that had set up an office in Vancouver to complete the TransLink project) over the course of several months to various communities (Burnaby, Coquitlam, Richmond, Vancouver, White Rock and Surrey) asking people to detail their trips to and from home on a particular day, and their modes of transportation. Those who participated in the survey were given information about transit, bike paths, and ride sharing in their area, an opportunity to express their opinion on transit and transportation needs, an umbrella, and, in some cases, a bike tune-up or other goodies. Well yes, midway through the first of a two-week time period set aside for these consultations, it certainly is. The consultation was first announced via press release March 27, 2009. Since I’ve been following Ken on Twitter for months now, I must have missed that tweet. So I called Ken to ask him how TransLink had decided which communities were going to get consultations and which ones weren’t. He explained that 22 Lower Mainland communities are part of TransLink’s mandate, and consultations were planned for 10 of those communities. The provincial election campaign meant the consultations couldn’t start till after the May 12, 2009 election, thereby compressing the time frame to get them done. Of course the election date was legislated long before TransLink planned its consultations, so I wonder how relevant that is. During the election campaign TransLink officials were busy briefing the mayors and council of its 22 constituencies, including New Westminster’s. 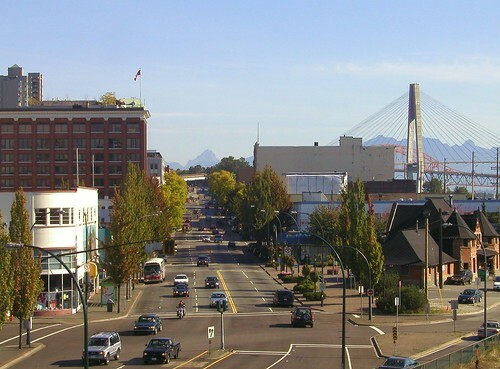 New Westminster is at the epicentre of the Lower Mainland. Burnaby to the north (and west). Surrey to the southeast. Coquitlam to the east. Richmond and Langley to the southwest. Vancouver to the northwest. You can get from New Westminster to North Vancouver in 30 minutes’ drive time (20 minutes on the way home – uphill/downhill does make a difference). And when the Patullo Bridge was closed for emergency repairs at the beginning of this year, an astonishing thing happened – the entire community was transformed. Before I read the comments referenced in this blog post, I couldn’t figure out what was going on. And after reading them, I realized, oh, this is what life would be like if the bulk of the traffic in New Westminster was actually New West traffic, and not merely flow-through traffic. Because suddenly Royal Avenue wasn’t a street with an endless stream of cars whizzing by at 80kph. In fact, it can’t be said that any of the traffic whizzed. And since TransLink has responsibility not only for buses and SkyTrains, but also for bridges, and since current residents of New West are very directly affected by the routing of traffic from the Patullo Bridge through New West, it would be nice to be invited to share our vision of transportation. Even if that vision includes some negatives. I have never forgotten the story of the woman who operates the lingerie store on 6th Avenue who keeps her store door locked after she was attacked and robbed in the store. She says crime is way up in New West since the SkyTrain stations have gone in. And you’ll note the line in the Wikipedia article saying to avoid Columbia Street at night (two of the five New West SkyTrain stations are on Columbia Street). The only place I’ve ever actually seen a drug transaction go down in living colour was right across from the New West SkyTrain station – never before have I seen ‘product’ and cash actually change hands except on television or in the movies. And I say that having lived in downtown Toronto – in neighbourhoods that can best be described as ‘transitional’ – for 25 years. So it would be nice to have the opportunity to get some real statistics that correlate crime rates with timelines to see if there’s any truth to the notion that crime rates have risen since New West got its SkyTrains or put it to rest once and for all. Stephen Rees has a nice analysis of the politics behind the consultation and an assessment of the options TransLink’s looking at in this post. Which brings us back to the mayor and council TransLink briefing and a possible divergence of view about what we want New West to be as a city. Replacement of the Patullo Bridge would not be under consideration if there was significant political opposition to it, said Hardie, and that while former New West mayors Helen Sparkes (1996 to 2002) and Betty Toporowski (1988-1996) were adamant that nothing be done to increase the flow of traffic through New West as opposed to to NW, the new administration wouldn’t be talking to TransLink about replacing the Patullo Bridge if it weren’t willing to sanction increased flow-through traffic, because that will certainly result from the Patullo rebuild. I have to wonder if New West City Council thinks of parking for those in transit to Burnaby or Vancouver as its ‘killer app.’ During the Patullo Bridge closure that coincided with #snowmageddon, TransLink posted this media release from the City of New Westminster on its web site, reminding commuters from Surrey that parking’s available in New West and rather than brave the unplowed streets they could drive to New West and hop onto the SkyTrain to continue their journey downtown. Let’s look at the economics of this a bit: suddenly your drive from Surrey to Vancouver costs you whatever you’ve spent on gas and overhead for your car; $6 for parking all day; and close to $4 ($3.75) for a two-zone ticket to get from New West to Vancouver. You’ve not only spent close to $10 to get to work, you haven’t even had a cup of coffee yet, and, more important, most of the money you’ve spent has gone into TransLink’s or the New West municipal coffers, none of it to area merchants and/or residents employed by those merchants. And it was funny, reading TransLink’s backgrounder ‘What have we done for you lately?’ to see in the New West section that the first accomplishment listed was the repaving of the Patullo Bridge. That really only benefits New West if you’re trying to go to Surrey or if we were benefiting from the traffic flowing through New West from Surrey on its way to Vancouver. And I’m not so sure that we are. The suggested parking lot is far enough from both SkyTrain stations on Columbia Street that it’s unlikely anyone would stop to pick up coffee and a muffin while walking from car to SkyTrain station. And what’s open at 7AM anyway? Maybe a couple of sit-down greasy spoons whose coffee you wouldn’t want to drink and the area Starbucks. Other improvements to come include road improvements to the north bank of the Fraser River between the Queensborough Bridge and United Boulevard; a bus to run between the 22nd Street SkyTrain station and Walnut Grove, FTN service on routes connecting New West with Vancouver, Richmond, Metrotown, Brentwood and Coquitlam; and new community shuttle routes and improved service to Annacis Island and Queensborough. Then of course there are the other issues, like the anticipated growth of New West itself. The City estimates its population will hit 85,000 by 2015, up from the current 55,000. Much of the large scale development underway is at the Columbia Street end of town, where several large towers are nearly completion. The infrastructure and the retail mix on Columbia Street is going to change now that the city’s finally acquired the waterfront land it wanted for so long – it’s going to have to change to accommodate the influx of new residents (perhaps the Heritage Grill will have to double in size. Although I’d rather see some new restaurants spring up). A day or so after I talked to Ken I read about a New Jersey community of 2800 people (about the same size as Lions Bay). A woman there is starting a community farmers’ market to capitalize on the 50,000 visitors that pass through the town during June, July and August on their way to beaches elsewhere, which is a brilliant idea that will probably benefit the whole town in the summer months. Once stopped, people will want to have coffee (lunch, dinner, ice cream) as well as buy produce for their weekends away. With its user-unfriendly back-in angle parking on the part of Columbia Street between 4th and 8th, it’s not likely New West will benefit from increased flow-through traffic without making some significant changes. I mention Lions Bay in the context of these consultations because I used to live there. As part of its ‘what have we done for you recently?’ round-up, the TransLink document mentions increased service from Lions Bay to both West Vancouver and downtown. Too late for me, and, as my former landlady said to me, “All those years of chauffeuring kids to dentists’ and doctors’ appointments and sporting events and now as soon as they’re grown there’s a bus every hour.” Which is why consultation and planning are critical. Squeaky wheels do tend to get more oil, and perhaps Lions Bay wasn’t squeaky enough in the past. While there are some families with young children in Lions Bay, its overwhelming demographic is baby boomers with grown children. Perhaps that will change now that transit service is more frequent. But perhaps it won’t, and hourly bus service may not be necessary. What has become glaringly obvious as Ken Hardie livetweets the questions asked at the consultations is that each community has its own specific set of priorities and concerns, as well as its own topographic challenges. Depending on how the financing goes and whether the plan is approved or not, TransLink may be back out in the communities it serves in as little as two or three years – or it may not be back till much closer to 2020. I’ve asked that the next consultation be held in New West rather than Burnaby, and Ken was open to that idea. In the meantime, if groups in New West want to get involved and have their say, they’re welcome to attend the final session in Richmond on Wednesday, June 24, host a ‘Front Room Forum’ or share their views on the consultation discussion boards. Community and stakeholder consultations are labour- and resource-intensive efforts at the front-end stage (preparing presentation and handout materials, getting the word out via public relations, social media and advertising, selecting and booking venues, organizing catering, co-ordinating schedules) and labour-intensive at the delivery phase. TransLink CEO Thomas Prendergast, who took over the role in July 2008 after a distinguished career with New York’s transit system, has attended all but the Surrey consultations to date, presenting the TransLink vision for transportation in the Lower Mainland till 2020. My hat’s off to him. I just wish that instead of the advertising dollars spent on ‘Be Part of the Plan,’ there had been more money and effort spent on public relations so more people would have realized what this consultation was all about. I’ve seen the ads on television and I’ve seen the print ads in the Vancouver Sun and The Province. For some odd reason – it must be the use of 2010 – I’ve thought for months this had something to do with the traffic plan for the Winter Olympics in 2010. But it doesn’t. Let me know in the comments if you too wish we’d had a chance to have our own presentation and consultation here in New West. *Note: @10thtotheFraser, @gnb, @waferboard, @duckbeaver, @matthewlaird, @jenarbo and @ruthseeley are among the most vocal of the New West contingent. You can follow New Westminster-related Tweets by searching for #NewWest. As always Ruth, well said. I'm torn about New West – I want it to stay small town, but I want it to grow up to have a presence in the Metro Vancouver area. Sort of a cake and eat it too. I walk to the skytrain for various things, down the ridiculous big hill to the station. I NEVER feel safe at New West skytrain station. Especially now with the construction, the elevators are on the hardly used side, and walking along Columbia in front of the now-empty Sally Ann building to get around to the elevator access is gross, loud, and takes so long. And its all because for whatever reason they decided to install a FENCE so that users of the train must access the platform from 8th Street. I hate it. The way they've handled the elevators at New West Station during construction has been terrible. I also don't feel safe going into a deserted, dark area – and very tempted to take the stroller up the escalator instead. I try to get into the elevator at the New West SkyTrain station with other women and women with babies so we'll ALL feel safer. That way if someone unsavoury bursts in at the last moment one of us will able to find our cell phone (or the emergency button?). I'm increasingly conscious of the fact that I can't run very quickly these days due to a chronic Achilles tendon issue. But then neither can people with bags of groceries or babies in tow!